#MoviesMusicPlaysFilmFestivalsConcerts: News: Kristen Stewart named 2015 Best Supporting Actress by NYFCC; "Carol" sweeps! News: Kristen Stewart named 2015 Best Supporting Actress by NYFCC; "Carol" sweeps! Kristen Stewart shakes up Oscar race with a surprise win at the NYFCC voting today. Her win follows her historic win at the Cesars in France earlier this year. She could just be the dark horse contender this year! 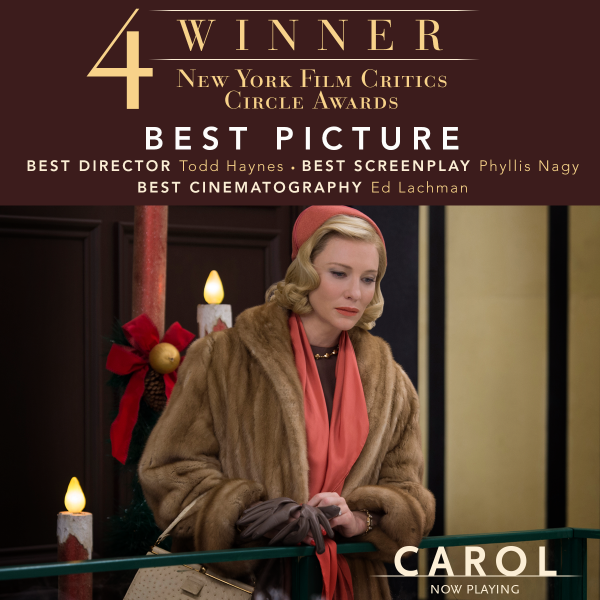 "Carol" meanwhile nabs a commanding four awards possibly costing a best actress nod for Cate Blanchett or Rooney Mara.